In 1947, Arnulf Erich Stegmann resolved that in future he would work together with all his colleagues who, like himself, create works of art using the mouth or foot. So it came about that, in 1957, the first General Assembly was held in Vaduz, to carry out the official founding of the VDMFK. This was the beginning of the 60-year success story. Besides President Arnulf Erich Stegmann, the Managing Board was composed of the artists Corry F. Riet from the Netherlands and Charles Pasche from Switzerland, as well as Legal Advisor Dr. Dr. Herbert Batliner. Right at the beginning, an important milestone relating to the openness of the VDMFK was achieved through the following additional passage which was ncluded in the statutes: “The VDMFK has a neutral attitude with regard to eligious, philosophical and political beliefs. Any preferential treatment or iscrimination due to the religious, philosophical or political beliefs of a member is therefore impermissible.” Thus, the Association formally showed its great espect for all disabled artists, irrespective from which part of the earth or cultural group they may come. Parallel to the General Assembly, art exhibitions and joint leisure activities were conducted. This supporting programme was thus a fixed part of General Assemblies and Delegates’ Conventions right from the start. Due to the passing away of Corry F. Riet, the later President Marlyse Tovae from Switzerland was elected to the Managing Board at the 3rd General Assembly in 1959 in Edinburgh. Four years later, the VDMFK had already achieved its aim of having artists from all the earth’s continents as members of the Association. From this point on, it was a worldwide-active organisation, which championed the interests of disabled mouth and foot painters in order to enable them to live free from financial hardship. From the time of this 5th General Assembly, the VDMFK already numbered 54 full members and scholarship holders. Due to the extremely rapid increase in members from non-European countries, a change concerning the General Assembly was now necessary. The Delegates’ Convention now became the highest organ of the VDMFK and was composed of representatives from three electoral groups. These were: Europe and Africa, all South, Central and North American countries, and the rest of the world. Every electoral group with at least seven members could send a member to the Delegates’ Convention. Among the tasks of this Delegates’ Convention were the election of the Managing Board and also the passing of resolutions concerning any change to the statutes. At that time, it was laid down in the statutes that the President and Founder, Arnulf Erich Stegmann, had been elected by the General Assembly for life. The first Delegates’ Convention took place in 1965 in Toronto. As well as the Managing Board members, six delegates of the electoral groups and six guest delegates from North and South America also gathered in Toronto, to participate in this Assembly. In addition, it was the first time that an Assembly was held outside Europe. President Stegmann joyfully announced that the number of members had now reached 80, and the Association was at that point already represented in 25 countries of the world. With the 2nd Delegates’ Convention in Bombay, a meeting of the VDMFK was for the first time held in the eastern part of the globe. From this time onwards, the Association was also represented in Turkey, Israel and Kenya. In the same year, the later VDMFK President Eros Bonamini was received into the Association as a full member. At the President’s recommendation, Wladimiro Bubola was appointed the first honorary member of the Association. The rapid growth of the VDMFK from a loose alliance of a few mouth and foot painters to a worldwide-active association with more than 100 members called for a change in the statutes regarding its name. Thus, the name “Association of Mouth and Foot Painting Artists” was changed to the “Association of Mouth and Foot Painting Artists of the World”. This official name was destined to remain valid right up to the present day. Year by year, the Association was attracting ever more public attention. One contributing factor was certainly the large number of exhibitions which were organised by the Association and its publishing house partners. Painting demonstrations, at which mouth and foot painters displayed their painting techniques live, always aroused great interest. This is the only way for people without physical disabilities to understand what an extraordinary achievement it is to paint motifs with such faithfulness to detail by mouth or foot. On 5th September 1984 the Founder, Arnulf Erich Stegmann, passed away at his hometown and place of residence Deisenhofen near Munich. Mouth and foot painters all over the world mourned for their Founder, to whom they owed so much. Due to the passing of Erich Stegmann, the election of a new President had to be carried out at the 7th General Assembly in 1985 in Madrid. 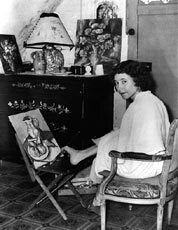 The choice fell on the French foot painter Marlyse Tovae, whereby she was elected President of the Association of Mouth and Foot Painting Artists of the World. In 1991, the Managing Board started a tradition which was important for the members – namely, an Artists’ Gathering to be held at regular intervals, at which mouth and foot painters could deepen their friendships with one another. The first such gathering took place in 1991 in Taipei, and was hailed very enthusiastically by the participants; many more were to follow over the subsequent years. In 1997, Vienna was the venue for the 40-Year Jubilee celebrations of the VDMFK. To mark this occasion, an international exhibition was held at the Vienna City Hall, featuring over 260 works by mouth and foot painters from all over the world. The then President of Austria, Dr. Thomas Klestil, thereby undertook the honorary patronage of the event. 2007 the VDMFK celebrated their 50-Year Jubilee again in a large scale in Vienna. You can read more about it under our menu item “Festivities in vienna“. In 2002, the election of a new President took place at the 9th General Assembly – as, sadly, President Tovae had passed away on 28.7.2001. Eros Bonamini was unanimously elected third President of the Association by all those present, an office which he has occupied very successfully right up to the present day. Year by year, the AMFPA has been able to gain ever more popular recognition, thus enabling ever more people with physical disabilities to enjoy a financially secure and fulfilled life. Today around 800 mouth and foot painting artists are working creatively in the service of the VDMFK as full members, associate members and scholarship holders.